The new Eduard kit of the 1/48th scale Su-27 is a limited edition kit, only 1500 will be released worldwide, so on paper the combination of an interesting/cool subject in a popular scale in these numbers looks to be a no brainer. However the forums as usual have been “active” with their own buzz about the kit. “Too Expensive” is the main buzz word. Well that may have been the case if nothing of quality was added. However there has been some re-tooling going on from the original Academy kit, and Eduard have added their own “Brassin” line improvements in resin, plus new photo etch details, a canopy mask in kabuki and decals by Cartograf of five subjects to sweeten the deal a lot more. We will compare prices after we look at the kit. There are six large sprues of a dark duck egg blue styrene and one clear styrene for various lenses and of course the aircraft canopy. Included are two sheets of Photo Etched, one coloured for the cockpit parts mainly and another bare silver coloured for the external additions and corrections to the base kit, of course there is a coloured instruction booklet in the usual Eduard style and lastly the extra “Brassin” additions which make up the full package. You can get a good handle on this kit by reading the detailed and easy to follow fifteen page instruction booklet. This is printed in glossy black and white A4 pages with bits of colour to denote the Photo Etched and “Brassin” resin replacements. I think they are well thought out and logical. They demystify an otherwise tricky little kit once all of the extras are taken into account. That is enough about this until the aircraft’s colours - let’s look at the styrene itself first, starting with the plastic - the base for this kit. We really have to discuss the history of this kit if we want to examine this current release. The original Academy kit of the Su-27B flanker was released just before the last millennium (wow – 1994 - the old days hey?) and was well received and criticised in equal parts. Modellers were happy for the release and the surface detail and shape of the kit on the whole but were unhappy with the lack of details in the cockpit tub and instrument panel, the after burners, the nose cone and the tyres. 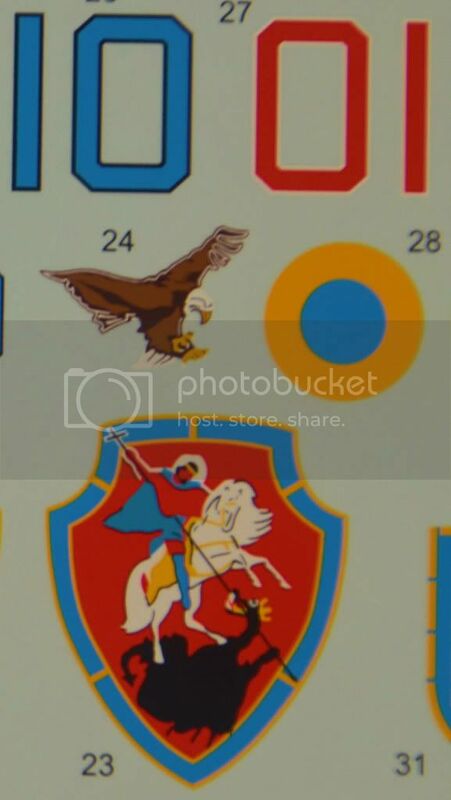 Seeing this Academy has only just this year updated their Flanker in a partial new tooling of their kit this year. Eduard has used this as the base of their limited release. What has changed you ask? On the Dark Duck egg blue sprues there is no errata of flash and no sink marks detectable. There are of course injection pin marks but all are in sensible place on the kit so as to no see them when in construction. If you look at the sprues there are some subtle changes to them which we will go through in order of the changes on each sprue. We will look at the substitutes that Eduard offers on the way through as well. The two fuselage halves are quite sensibly sandwiched together in the fashion of an F-16 kit – The top and bottom half of the airframe are joined as to lessen the joins going across the kit. The seams instead here run horizontally here across the leading wing extensions which runs nearly right up until the radar dome. There are however two places that will need attention with some filler. All of the Academy flankers I have seen made up has had the gap at the front filled. There is also a gap at the rear where the top and bottom are secured together on the flanks in front of the horizontal stabilizers. These are shown squeezed together in the picture below, the joint’s gap however isn’t that hard to fix. You need to firmly place the halves together and then after both sides are glued simply smooth over with putty and then rescribe the lines you will lose from the putty. When you think about it a bit of proper “modelling” and you will be left with the rest of the kit which goes together very nicely with no real other seam areas to deal with except maybe the intakes underneath which require some filler to smooth out the gaps. The panel lines and surface detail itself is still very good and the recesses aren’t too deep – areas around the guns and tail sections especially where the aircraft can take some weathering will come out pretty accurately when compared with the aircraft in real life. A really good job was done on this and nothing needed to be changed here. The width of the kit is correct as to the drawings I have (but then again who says the drawings are ever accurate) but the length is still about one and a half centemetres too short as the length of the plane when conceived in kit form by Academy did not take into account the pilot probe. I haven’t been the first one to see this, but the problem would be very very hard to fix without a complete re-tool. The bottom of the fuselage near the round part of the intakes needs- like the Academy kit – a small round fillet removed from it to be correct as well – this has been done in many online builds and is easy to rectify with some minor surgery. Shame Academy will have to live with it (and us I suppose in this instance) and they didn’t do anything about it. Both of these sets look more correct but only with the help of a plan or after it has been pointed out would you notice. It depends on the type of modeller you are as to whether you would replace this part – as I said only someone really in the know would notice. Buying one of the aftermarket noses would slightly increase the length of the kit to make it closer to the correct length though so it’s worth thinking about for a pretty low cost. While we have talked about the canopy the clear sprue has the two part canopy there but the slightly narrow profile at the top has been kept. It should be a little bit more bubble shaped at the top with a pinched lower section like on the F-18. Again Fairy Hobby makes a beautiful and cheap crystal clear alternative. You will not have to remove the seam on the kit canopy as well if you have this. It isn’t a big deal though if you are armed with some progressively finer grit sanding sticks, the seam will take just a few moments of work to correct. The "pinched" look of the canopy above is evident here with the bubble like top part - the kit part is more squarer and narrower. The transparencies include the infra-red glass of the Air to air missiles and the Head-up-display. There is a part A and a Part B film included for the HUD as well. Moving onto Sprue A - we can see that there has been some changes. The ejector seat for example has been given more detail and the a harness is now added to the padded seat part, this will not matter to a lot of people as Eduard have supplied a superior “Brassin” upgrade which comes in two main parts and pretty much leaves the initial plastic kit in the dust. Well for one gone are the horrible rubber tyres - not many people were happy about these – so it was a good idea to change this. From a lot of feedback out there rubber tyres I would think are only liked by about 10% of people out there. These look very detailed with raised detail of the writing of the tyres (just a little too raised for me) this is easy to fix though just a little sand with fine sandpaper an all will be looking very nice. The instrument panel has also been changed in the new tooling, though again Eduard have bypassed this as well with a coloured Photo Etched set which again is a much better alternative to the raised detail styrene offered in the original or updated tooling. Having the Eduard P/E coloured parts is a fast and very nice way to model, I used to think they are cheating but they raise the bar so much its almost silly not to use them if you have them. 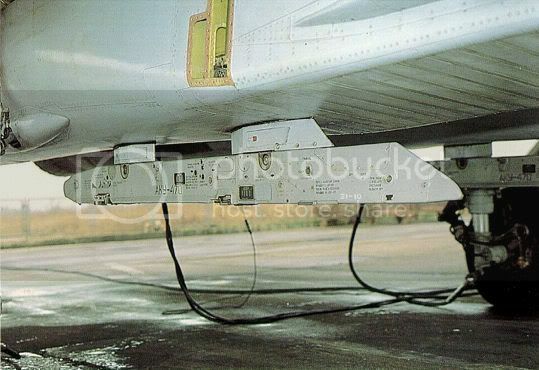 Also on Sprue A – The Afterburner cans are a bit to “pointed” at the rear of the aircraft. – Pictures of the Flanker at rest show a slight splaying at the rear end. Whether this will catch your eye or not is the choice you will make in just modelling it straight from the box or using some aftermarket external ‘cans. I would leave them; they look good enough to me. Again, the interior detail of the original isn’t 100% correct – but Eduard have added a Photo Etched ring inside to further detail this area – this is an improvement over the original by quite a bit. The landing gear is on sprue A as well and it is quite satisfactory. Some have said it is a bit flimsy but careful construction and handling will look after any concerns you may have. It looks accurate to shape and scale thickness. Eduard has again added PE details to this part of the kit so the landing gear should look great once all put together. In addition on sprue A there is another correction by Eduard themselves – this is the mudguard of the KN-27 front wheel. Eduard have mad an excellent replacement (it looks a little bit like a cyber-man’s helmet) of this mudguard in the “Late” production style of mudguard with the one rounded-off rectangular hole shape and the slots in the rear which were absent on the early guards. An excellent addition. The original and the "Brassin"
The seat was a sore point on the original Academy release they have re-tooled it - but not a bother with this as Eduard have given us a Brassin alternative - this plus the Photo Etch in colour just makes the even updated styrene seat look as bad in comparison as the old one - a non issue here just replace it! 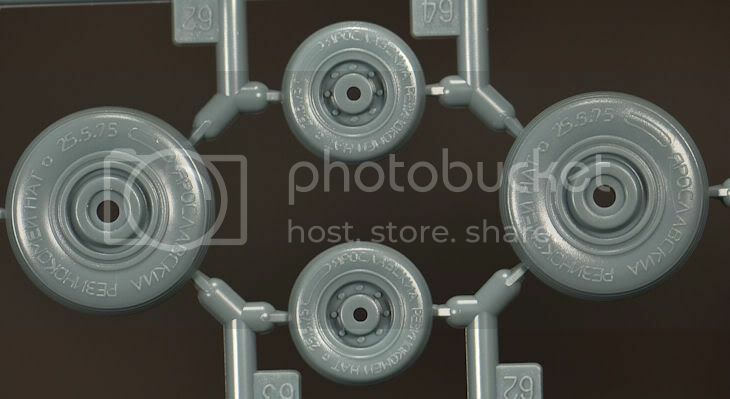 This looks to me like the changes on the first sprue – and that is it for anything different! A few things have moved on that sprue sure and the seat, wheels and instrument panel have been changed but that seems to be it from what I can see. Really this is the end of the minus points for me - the rest of the kit i like very much. Sprue B in my box was cut into two halves neatly down the middle – I have looked at pictures of the original academy sprues to see what might have been added and I cannot see anything. It seems they were cut in half simply to fit in the box. Sprue B consists of many of the other external details like the engine intakes and the horizontal tail surfaces. These tail surfaces are joined together (2 parts to each) and show some excellently restrained surface detail. The ventral tails are also the correct shape and thickness, again the refined rivet detail shines as one of the best features of this donor kit. The engine intakes are again another excellently crafted part of this model, lots of fine rivet detail and some vents which will detail up nicely under a wash. There will of course be a gap running down the centre but some putty will fix that. I have seen some people make the underside of the intakes a bit thinner to become scale correct which is an easy and eye pleasing correction to add to your model. Other additions here are the leading edge slats (which when applied may need an anchoring point to firmly secure them to the front wing fillet) these are thin and to scale and will give depth to the front of the wing area. The Guys at Eduard have added some excellent photo etched FOD grilles to insert inside these intakes – carefully painted the intake will look excellent. We also have the underside grilles in PE so they are extremely thin, Just as they should be. Sprue C contains the horizontal tail surfaces which again are excellent in surface detail and shape. You have the option of positionable flying surfaces with this tail and like the wings, tails and ventral fins these are well detailed and should weather up very nicely. The other parts of the C sprue are the airbrake which really should go in a closed position as the insides are nothing to write home to mum about. A hydraulic ram is provided for that option, but unless you want to show the aircraft slowing down or taxying after landing the detail isn’t strong enough to display it open. It would be closed at rest anyway. The next option came up with some stick on the original Academy release. It looks like Academy has re-tooled the soft details and the depth of the original cockpit tub. Really it was a waste of time with to re-do it on this kit though as Eduard’s Excellent “Brassin” replacement leaves this one too in the dust for detail. The dials, pedals and switches are excellent in this resin alternative. With the seat and coloured PE this will build up into a really impressive cockpit. Sprue D contains all the missiles you could shoot at an F-35 – as well as their pylons, there are fourteen missiles in total. Most of these come with their tails already attached but four of the AA-10’s have tails on the tail part on the sprue to be attached. The radar guided (R-27RE) and infra-red (R-27TE) AA-10 “Alamos” are good in shape but need a nick taken from the rear of the front guide fins just to get rid of the square appearance - no big deal here - and as a nice bonus the clear transparency sheet has the infra-red clear part included on that as a clear part. There is a nasty seam running the lenth of one of the smaller of the AA-10’s but of course that is what a hobby knife is for. The smaller still four AA-11 Archer/ R-73’s are good if you do not look too hard at the little knobs on the front which should be very tiny fins/angle of attack sensors. The shorter range AA-8 APHID / R-60 is good but the tails are a little too big. If I was modelling all of these missiles I would cut off their fins and make my own from metal/tin or the thinnest card plastic I could find. They are adequate but even better would be to plum for some of the brand new missiles (the AA-10 family) Eduard is bringing out- including missile carts, in February . Here is the link – they are sure impressive and a shame they are not included with the kit in its limited release - maybe a Royal release later? The Photo Etch Sheets come in two flavours. The pre-painted instrument panel sheet which I mentioned earlier is just a no brainer unless you like to paint your own cockpits. These speed up the build no end - the improvements are easy to apply and are included of course in coloured parts of the instructions. This sheet includes lots of parts for the side consoles and the ejection seat. These are a great inclusion. The regular unpainted PE sheet contains some things mentioned earlier which I think are excellent additions to this kit and which bring it way ahead of any flanker in this scale (including the new Academy single seat Su 27 kit to come.) The FOD doors, lower shutters and afterburner insides I have mentioned are complimented with great bits like wheel well detailing and wiring and cockpit ”shelf” detail which will look just great under some paint. The large decal sheet is printed by Cartograf. I was really impressed by these decals. The absolute lack of nearly any visible carrier film and the detail of the decals here are a great sight to any modeller. The fine printing can be seen against my “massive” 20P coin I put next to the sheet. The colours are strong and consistent and the whites are not translucent. A great set of decals in five different marking choices, each from varied sources and locations which I like in a decal set. Cartograf printed and designed by Eduard they have done really well here. There is an addendum page of stencil placements included in the instructions which is good because with the flanker there are MANY! They are tiny – but they are clear, even to my old eyes. 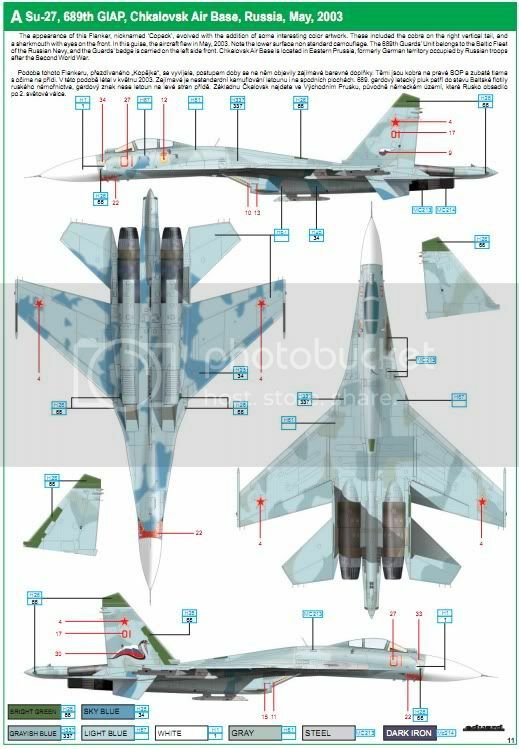 The price: A lot of chatter about this, and lets look at it - Often a reviewer who disregards this isn’t being true to his audience so I wont ignore it - The question is does a 1/3 more expensive than a similar sized limited edition Mig 29 kit in the same scale by Eduard make sense? The asking price on the Eduard website is 1800.0 Czech Koruna, this equals USD$93/£60 and I have found it for £61 + 3.50 delivery in the UK. Well some say just get the older Academy kit and various add-ons from other companies as an alternative. There is merit in that but I like the choices of the package on offer here. The decals, Brassin and PE really make the parts of the model you really want to show off look amazing. This is a money/fun issue with me. With all of the quality add-ons supplied I think it would be worth £60 if I was to buy it at the shops. It definitely isn't worth my time shopping around for all of the different bits if you only had the Academy kit to work from. The Brassin Extras - along with the decals, masks and P/E they sell the kit for me. I am a little sad that some of the easy to fix inaccuracies have not been corrected in the re-tooling. Ironically the things that have been made better have also been made redundant by Eduard’s Limited edition add-ons. I would add a replacement nose and bubble canopy to this but that would be it. This is not the perfect flanker, but no one else has done it in ANY other scale either after many tries. Eduard has come close with this release and what they have included in this release. I think Eduard has done well with this boxing. If you are a Flanker fan - and there are many out there - you will like this kit as it is a real improvement over the Academy offering in 1/48th. I would get this over the cheaper Academy kit (forthcoming and past) just for the quality of the add-ons the potential they give to this model. It will sell quickly as the release is limited to 1,500 kits worldwide. I would get in quickly if I were you. Thanks to Eduard for this Kit. It is available at the link in the banner below.